Watermelon is wonderful this time of year – sweet, juicy, and crunchy. If you are out grilling during the summer holidays, it can be a perfect dessert. If you can get watermelon that is cold, it is even better. Consuming watermelon is also great from a health standpoint. The vegetable contains lycopene which is said to reduce the risk of cancer and heart disease. Unfortunately, migraine sufferers can experience increased migraine episodes from watermelon. Yes – watermelon may not be safe if you suffer from migraines! Several health websites, including those of some prominent Universities, state that watermelon is safe to eat for those of us with migraines. This is only true under certain conditions as the fruit cannot be too ripe or unripe – it has to be perfect. The problem with perfect is that it does not leave a comfortable margin of error. As with other foods, aging is a real problem for those of us with migraines. After a certain period of time, sugars are broken down into alcohol and CO2. This process of decay also produces a biogenic amine called tyramine, which can be a migraine sufferer’s worst nightmare. 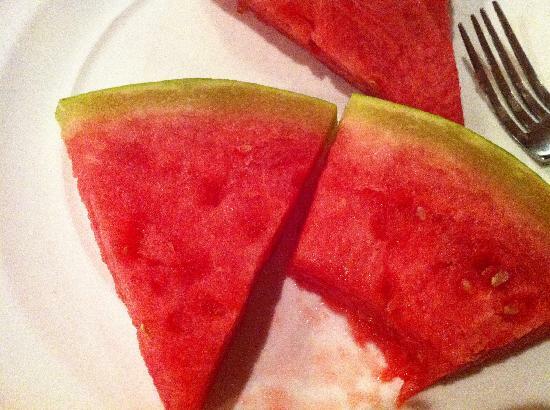 So what does “Unsafe” watermelon actually look like? When a watermelon is a pale shade of green or white, it is unripe. If you consume it at this stage, you experience an acidic taste. For migraine sufferers, the increase in acidity may cause a migraine headache. 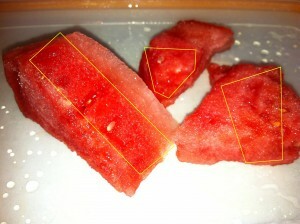 If the watermelon is too ripe, it develops dark red soft spots as in the picture shown below. It will also have light pink/white indentations that may or may not contain seeds. It also tastes too sweet, with a slight bitter after taste. If you see any of these spots, throw the watermelon in the trash. The spots are indicating that the vegetable is high in tyramine. When you cut the watermelon in half, it should be the same pink color across. If it is too red, it is also a cause for concern. You also need to make sure that the inside is not bleeding out into the shell as shown below. 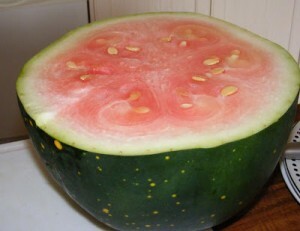 Cut the watermelon up immediately when you bring it home from the grocery store and place in the refrigerator. Only put as much as you are going to eat that very day into the refrigerator. Place the rest of the chopped up pieces in one or more zip lock bags and right into the freezer. This guarantees that each piece remains as fresh as possible. Under no circumstance should you follow advice that says you can safely leave the watermelon out to ripen for several weeks if it is not yet ripe. Well, like so many others, I get migraines after eating watermelon…bummer. I love this fruit and am grieving having to stop eating it. Used to be one of my favorite foods. Additionally, want to “complain” on a different type of food, or beverage that I used to enjoy, in moderation, of course: beer…Do I ever miss having a glass of cold beer out on the deck, in the middle of Summer…Gives mi brutal migraines within 12 hours. I was eating watermelons all my childhood, everyday in summer. But those were normal melons, with seeds ready to shoot on target or play with, those stories what happen if seed eaten, priceless. Melons I remember were sophisticated in taste, middle super sweet, and metallic cucumber near skin. There were the times, when I could eat only this for weeks. Since they made seedless watermelons, I feel, that it is pure sugar, or worse – cheap sweeteners, injected into poor fruit plus color. It tastes way to sweet and plain, without the refreshing feeling.Feels like a candida attack with fluids from nose after few bites. It gave me a solid migraine yesterday too. There is everyday less items to eat if you want to function normally. No flour, no milk, no fruits, no sugar, no ready meals, no restaurants, because of poor hygiene and cheap ingredients. B-3 help any one or Anti-histamine like Benyadryl? Same here, had some fruits for breakfast, watermelon and cantaloupe, on an empty stomach, and in a short while I had a migraine attack, so I goggled it. Now I know better, I guess I need to do more research on foods that trigger migraine. I have not had a migraine in over 30 years, until today. I ate a bunch of watermelon over the last few days and a bunch today on an empty stomach and ended up with a blind spot in my left eye, followed by a terrible headache. So I googled the connection too and was shocked to say the least, to find others having the same issue. At least I’m glad to know what probably caused it. I’ll avoid it in the future…sadly. Hi everyone, For me beside headaches, heart palpitation is also triggered after watermelons and many other fruits. My cure to this is 1 tbsp. of Chlorella and 1 tbsp. of Spirulina in 250ml water drink it up and it is gone in 2 min. I am not a migraine sufferer. But I noticed that I suffer from huge, splitting headaches after eating watermelon, especially if on an empty stomach and in large quantities. Ironically it’s my favorite fruit. I appreciate the comment and feel the same way – watermelon is tasty. If the headaches appear after eating watermelon, it could be a sign that you have other hidden food intolerance as well. Tyramine is found in other foods and could also be a possible reason for the symptoms. Have you ever had a full IgE antibody allergy assessment done? OMG, was I so hurt and disappointed when I found out that watermelon will trigger migraines. I LOVE watermelon. I had to give it up. It hurts so bad. I hadn’t had watermelon, nor a migraine attack all year. Then last month my husband brought home the BEST tasting watermelon that I have had in a very long time. I enjoyed it. About 1/2 hour after eating the watermelon I had my first attack this year. Knowing I had been careful about what I was eating, when I did a process of illumination, I concluded that it could have only been the watermelon. So I googled, “Can watermelon trigger migraines”. OMG, was I so hurt and disappointed!!! Spelling CORRECTION: . . .”process of elimination” . . .that’s a whole different world. I do get terrible headacs from alcohol and happens round about after the third or fourth drink my neck are so stiff and shoulders like going into a spasm. Today i had watermelon and also google it to find out why i am having the same type of headach or megraine as when i had alcohol. I can’t tell you how helpfull this information is …..I used to have constant migraines…but if I take regular multivitamins , it helps. Recently I read that watermelon is good to prevent water retention so I started having it everyday and since then my life became hell. I got attack of chronic migraine attack after having watermelon,specially if i take it empty stomach. This is why I endup reading this and got the answere of my problem. I love vegetable salads, specially onions and tomatoes and cucumbers. On top of all this, I love watermelon. Yes, I too get severe headaches if I consume watermelon. However, I do not get headaches normally at all and I am not a migraine patient. My fav fruit of all, I suffer with chronic debilitating migraines. Noe need to stop eating it. I understand. Sometimes, the best thing we can do for our migraines, and yet the worst in terms of immediate satisfaction, is to completely remove these types of triggers. Excellent info.. thank you for sharing.. I was not sure if it was the watermelon or iced tea I had started having this summer.. never had migraines before so often.. I narrowed it down to the watermelon and now am so happy to see the reason and that I can avoid them completely. I’m Vegan and eat LOTS of fruit. I get migraines from time to time and I thought it was my blood sugar. My Dr did a test to check my blood sugar levels for the last 3 months and they were normal. The only thing I noticed was the afternoons I get the migraines are the days I ate large amounts of watermelon for breakfast and lunch. Interesting. Normally, it would take at least 24 hours for the food to trigger the migraine, even if it’s from watermelon which has a high level of tyramine. My suspicion is that your tolerance on those days was already low from something else you had eaten. Since you are a vegan, if you eat onion, eggplant, and even cucumber, these could be triggers. Another thing to watch out for is pesticides since you are consuming lots of fruit and vegetables. It is extremely important, especially this time of year, to clean vegetables and fruit as thoroughly as possible. For many migraine sufferers, it can sometimes help to peel fruits like apples, pears, and the like. I’m not sure that’s true. I don’t get migraines unless I eat watermelon. It’s my only migraine trigger that I’m aware of, and the side effects (migraines and diarrhea) are immediate. It’s like the watermelon goes right through me because it comes out in whole pieces. It only takes one bite to cause issues. I just avoid it altogether. I have the same issue with watermelons. Migraine and full body inflammation and pain. Is there tyramine in other melons as well? There is tyramine in everything we eat, including melons. This is because it builds up over time as foods age. Melons are particularly problematic for migraineurs because they age a considerable amount of time to ripen. It is most common to have issues with water melons though. The best thing to do is to only eat fresh fruits and vegetables. More importantly, it is essential to stay away from offending foods altogether. In my case, I only eat a few pieces of a newly cut water melon. I too ate a beautiful heaping bowl if watermelon, perfectly ripened and sweet. I had the Worst migraine in a very long time. The only thing in common from the last time was watermelon. Who knew? Thank you for the info. I’m 62 years young but have underlying kidney disease. Bought the first watermelon this spring, ate a bowl and refrigerated the rest. The morning after I ate it I was sick. Sick!! Serious headache, diarrhea and nauseated. I felt totally hungover. I thought it because we had partied a little out on our boat fishing. A couple of days later, I ate some more with the exact same effect! I’m done with the fruit! It DID trigger a migraine! The first one with complete aura flashing in my eyes. The second time, a total headache, no aura.